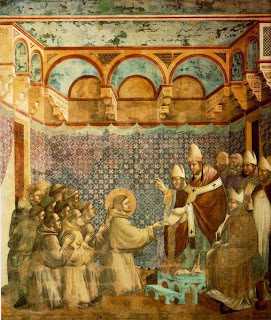 Francis’ conversion to Christ, “the desire to ‘transform himself’ in Him” is key to understanding the life of the saint from Assisi, which has become the model and ideal for the commitment on many modern day themes: “the search for peace, safeguarding nature, promotion of dialogue between men. Francis is a true master of all these things. But he is because based in Christ. Christ in fact is “our peace” (Eph 2, 14). Christ is the very centre of the cosmos, because through him all things were made ( Jn 1, 3)”. By centring the Poor man from Assisi in Christ, Benedict XVI re-vindicated the figure of Francis from attempted ideological and religious manipulation, which tends to portray him as an ephemeral ecologist in love with nature, or as a “soft hearted” soul, open to everything and everyone, an “excessive interlocutor”, forgetful of his Christian identity and of the Gospel. Since early this morning the Pontiff has been on a pilgrimage to the Franciscan sites of Assisi to celebrate the 800th anniversary of Saint Francis’ conversion. After a short pause at the Rivotorto, where St. Francis lived with the first brothers for about two years, he passed on to the sanctuary of St Damian, where Francis received the call of the cross to go and “make his Church whole again”, and the Church of St May Magdalene, the memorial of Saint Francis’ service to the lepers. During the homily in the square below the basilica, the Pope traced the personality and conversion of Francis referring to the figures of the converted described today in liturgy of the word, on the XI Sunday of the year. He recalled above all the personage and sin of David, fallen “low” and “blinded by his passion for Bethsabe”. Francis, continued Benedict XVI, perhaps did not sin as David, but – according to his own accounts as laid out in his testament - “above and beyond single episodes, his conceiving and pursuit of vain dreams of earthly glory was sinful”: His “naturally generous soul” did not allow him to dominate “the physical disgust” when faced with lepers. “By serving the lepers, by kissing them – underlined the Pope – he was not merely making a philanthropic gesture, it was not just a 'social conversion’, no, it was a religious experience, commanded by the initiative of God’s grace and by love for God….man is truly realised by the measure in which he lives with God and in God, recognising and loving him in his fellow man”. The third figure recalled by the Pope is that of the sinner whom Christ forgives because “they have greatly loved”. “In Christ – adds the Pope – God gifts us love and asks us for love”. And he adds: “My dear brothers and sisters what else was the life of Francis converted if not a great gesture of love? His passionate prayers reveal this, rich in contemplation and praise, his tender embrace of the Child in Greccio, his contemplation of the passion in a Verna, his "living according to the way of the Sacred Gospel” (2 Test 14: FF 116), his choice of poverty and his search for Christ in the face of the poor. This is his conversion to Christ, to the very point of wanting to ‘transform himself’ into Him, becoming in him a complete image, which explains his typical way of life making it relevant in all times regarding the great themes of today, such as the search for peace, safeguarding nature, the promotion of dialogue between all men. Francis is a true master of these things. But he is because based in Christ. Christ in fact is “our peace” (Eph 2, 14). Christ is the very centre of the cosmos, because through him all things were made (Jn 1, 3)… Christ is the divine truth, the eternal "Logos", in which all "dia-logos" finds its foundation. Francis profoundly incarnates this “Christological” truth which is at the very root of human existence, of the cosmos and of History”.